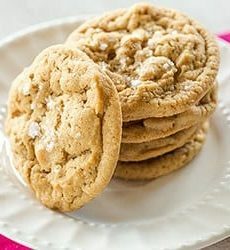 Soft and chewy peanut butter cookies with butterscotch chips and topped with fleur de sel. Using an electric mixer on medium speed, beat the butter until smooth and creamy. Add the peanut butter and beat until completely combined. Add both sugars and beat on medium-high until light and fluffy, 3 to 4 minutes. Scrape down the sides of the bowl, add the egg and vanilla, and beat until completely incorporated. Scrape down the sides and bottom of the bowl, add the flour mixture all at once, and beat until just incorporated, about 30 seconds. Using a rubber spatula, stir in the butterscotch chips. Scoop 2 tablespoons of dough into balls and place them on the prepared baking sheets at least 1½ inches apart. Bake the cookies for 5 minutes, then sprinkle the tops with the sea salt. Continue baking until the cookies just start to brown on the edges, another 5 to 6 minutes. Remove from the oven and place the sheets on cooling racks for 5 minutes. Transfer the cookies from the sheets to wire racks and allow to cool completely. The cookies can be stored in an airtight container at room temperature for up to 5 days.